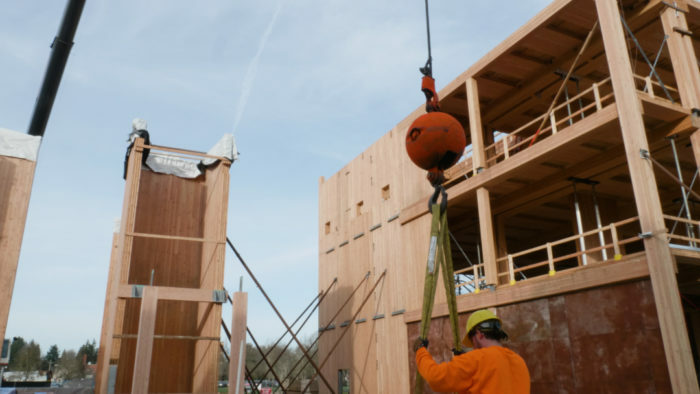 A 4-foot by 20-foot cross-laminated timber panel in a building under construction at Oregon State University failed earlier this month, prompting the university to hire an outside engineer to investigate but leaving its commitment to the construction technique intact. The panel fell March 14 after one end delaminated, in the Gazette-Times in Corvallis, Oregon. The 7 1/2-inch thick panel was made from five layers of 2×6 boards glued up at right angles (see image #2 below). No one was hurt in the incident. When completed, the three-story, 80,000-square-foot building called Peavy Hall will be the new home of the College of Forestry. The panel was manufactured by D.R. 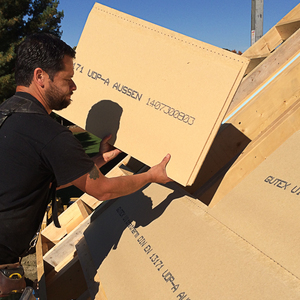 Johnson in Riddle, Oregon, the first fabricator in the country to manufacture panels certified for structural applications. Can Wood Replace Concrete and Steel in Skyscrapers? Steve Clark, the university’s vice president for marketing and university relations, said by telephone there have been no other problems with CLT panels on the project, and that the university remained “completely committed” to the construction technique. “It came completely out of the blue,” he said, adding that unexpected problems can crop up with virtually any building material. D.R. Johnson referred questions to its outside public relations representative, but the call was not returned. 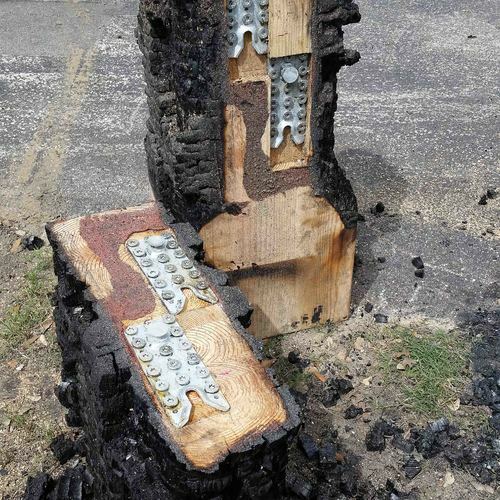 Clark said that 574 CLT panels had been set at the time of the incident, and that only 60 of them remain to be installed. The inquiry by an outside engineering firm was to extend into next week. 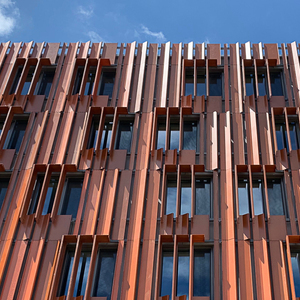 It’s a rare sour note for a building material that is seeing wider use on commercial projects in the U.S. and Canada. Proponents say CLTs have a smaller carbon footprint than more conventional steel-and-concrete structures, and can shorten construction times. 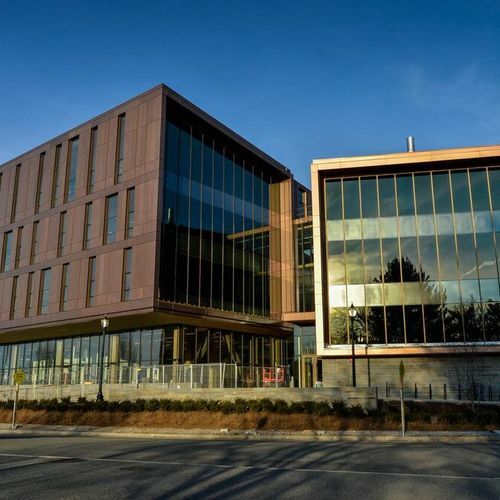 Panels have been used successfully on a number of well-publicized projects around the country, including a building at the University of Massachusetts (see the “Related Articles” sidebar above) and an office tower in Minneapolis. A number of other buildings made with CLTs are in the works. Clark says the university intends to complete Peavy Hall with the panels, as soon as engineers have taken a look at the one that failed and certified that others on the project are sound. The building is due to be completed early in 2019. Of course, defects can happen at any time but I know the timber industry in Canada is really pushing these CLT beams for high rise projects. 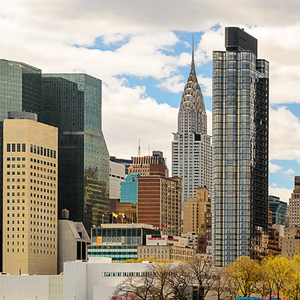 They are trying to take a bite out of the steel and concrete high-rise market. They claim a smaller footprint with the CLT's but as pointed out by another GBA article earlier this week, the "sustainable" harvesting of trees from forests has turned out to be mostly bunk. Once you take into consideration the heavy equipment, semi truck hauling, milling, etc., it's a wash in the end. "Once you take into consideration the heavy equipment, semi truck hauling, milling, etc., it's a wash in the end." There's a lot of heavy equipment and materials transport in the manufacture of concrete & steel too, as well as a HUGE amount of materials processing energy & carbon emissions going into baking the limestone, smelting the iron ore, etc. If it's really a wash I'd be curious to see at least the napkin math version of how that all pencils out. Just because sustainable forestry certification programs aren't really working as-intended doesn't mean that sustainable forestry isn't possible, or at the timber industry average practices the total impact is as heavy as that of steel & concrete construction. For the non woodworker this construction technique flies in the face of thousands of year’s woodworking history. That hard lesson is that cross grain glue joint often fail given a few cycles of high and low humidity. The reason being that wood absorbs moisture from the air and swells up and becomes larger across the grain but with no change in size along the grain. So when you glue a dry 12 in square board to another dry 12 inch square board, after the glue is set and the wood tries to expand say 7% or so a tremendous amount of force is being contained by the glue often the glue will allow the wood to move enough to expand but when it dries the glue holds and the wood will fail and crack leaving a gap. Other times the glue can flex enough to survive a few cycles but as it ages it become brittle and fails. I am sure the engineers have numbers to show that everything is fine, but from here it looks like they are dancing on the edge of a razor blade just to prove they can. "The results indicated that the laminated timber building design offered a lower environmental impact in 10 of 11 assessment categories. The cradle-to-gate process energy was found to be nearly identical in both design scenarios (3.5 GJ/m2), whereas the cumulative embodied energy (feedstock plus process) of construction materials was estimated to be 8.2 and 4.6 GJ/m2 for the timber and concrete designs, respectively; which indicated an increased availability of readily accessible potential energy stored within the building materials of the timber alternative." 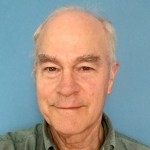 The authors found that feedstock energies in production of mass timber was higher (mainly from PRF and PU adhesives), but that despite this, an equivalently designed mid-rise mass-timber structure had statistically significant improvements on every environmental metric (global warming, eutrophication, ozone depletion, etc) except fossil fuel depletion. CLT is just plywood on a large scale. The glues used are stronger than the wood itself. Cross-grain movement is certainly an issue that every woodworker has dealt with, but the plywood industry (and the CLT industry) figured out the answers a long time ago. I can't think of a building nowadays that doesn't rely on a combination of wood fibre and glues. Plywood, OSB, underlayments, LVLs, Glu-lams, composite siding. Both concrete and drywall are essentially aggregate and binders. Michael lets think about how they make ply wood. One of the first things they do to the logs when making ply wood is put the log on a lathe and peal the log so thickest bit of cross grain is 1/8 of an inch. When ply wood absorbs water and swells up, the 4 foot and 8 foot dimension change very little what does change is the thickness. Oriented strand board is the same in that they make the strand by breaking the wood along the grain and glue it back together so when it swells it gets thicker but not longer or wider. The OSB plant near me makes 5/8" sheets from an 8" high pile of chips and glue pressed down to the final width. I'm not sure how any of this matters. A bunch of guys sitting around drinking beer in a shed didn't come up with laminated lumber products. They were developed by the same engineering processes as virtually all other products. I don't think they just somehow forgot about the movement inherent to the material. And they aren't new. Many of the grocery stores around me in the '70s were supported on huge glu-lam arches. Most are still in use today. Walter, I understand wood technology, and agree that CLT asks more of the wood fibers than veneer-core plywood or parallel-laminated lumber. 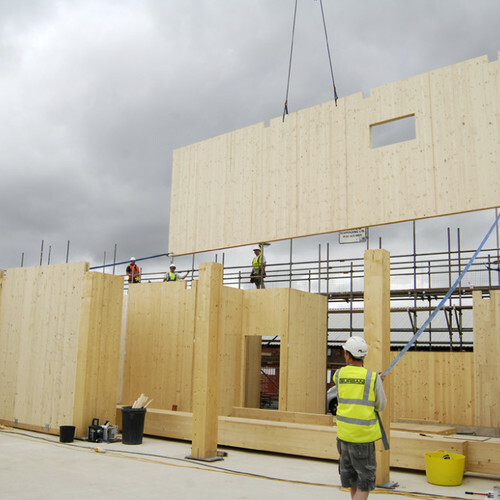 But CLT has also been in regular use in Europe for a couple of decades, so while it's not as time-tested as plywood, there are enough built projects to know that it's a sound concept. I'm not sure what happened with the Oregon panel failure, but I bet the people responsible will find out and it won't happen again. Regarding plywood, the expansion coefficient of lumber radially and tangentially is rarely more than a factor of two apart, vs. a factor of ten more than expansion along the length of the fiber, so thin veneers (sliced tangentially) don't affect movement all that significantly compared to CLT, which is a combination of tangentially- and radially-cut lumber. But the number of glue joints do matter, as does the strength of the material itself. My guess on the panel failure is that it wasn't a glue failure, but a shear failure within the lumber. 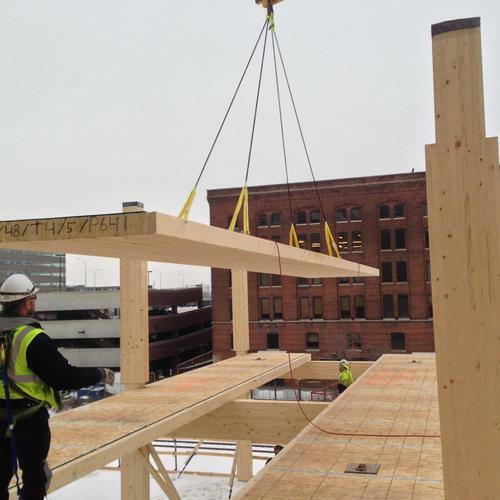 I'm sure the lumber used in CLT is machine-stress-tested, but that won't find every defect. 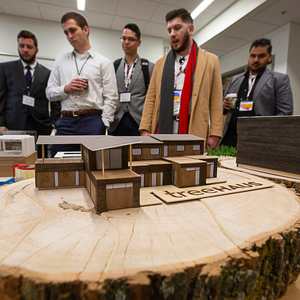 Tests at a federal laboratory suggest that cross-laminated timber (CLT) components used in a multi-story apartment building would perform well in the event of a fire.